There’s Nothing Like the Aracom PRX150-Pro! As many know who’ve frequented this blog over the past couple of years, they know my love for the Aracom PRX150-Pro attenuator. It has allowed me to record in my garage till the wee hours of the morning, and not get complaints from my wife or the neighbors about being too loud, as I can get down to conversation levels; but more importantly, I can get down to those levels and still retain my tone and especially my dynamics. With other attenuators, as you increase attenuation, it’s like putting a blanket over your tone. Not so with the PRX150-Pro. I’ve been using it now both in the studio and at gigs for the last couple of years, and it never ceases to amaze me. For instance, I shared a song the other day called, “Come Together.” I’ve since changed the name to “God’s Love Will Set Us Free” but what I failed to mention was that the electric guitar parts were recorded, close-miked with the volume level being normal conversation level! Though I was using just a 6 Watt amp, even that cranked up is simply too loud to be playing completely cranked at midnight – at least in my neighborhood. What great quality at normal conversation levels! Yeah, I mention it a lot, but I thought I talk about it once again, because it truly has had a HUGE impact on how I approach amps. To me, there’s simply no attenuator on the market that can touch the quality of its sound; well, it doesn’t produce sound of course, but it lets all your tone come through, but more importantly, no matter where you set it, you will always have your dynamics. 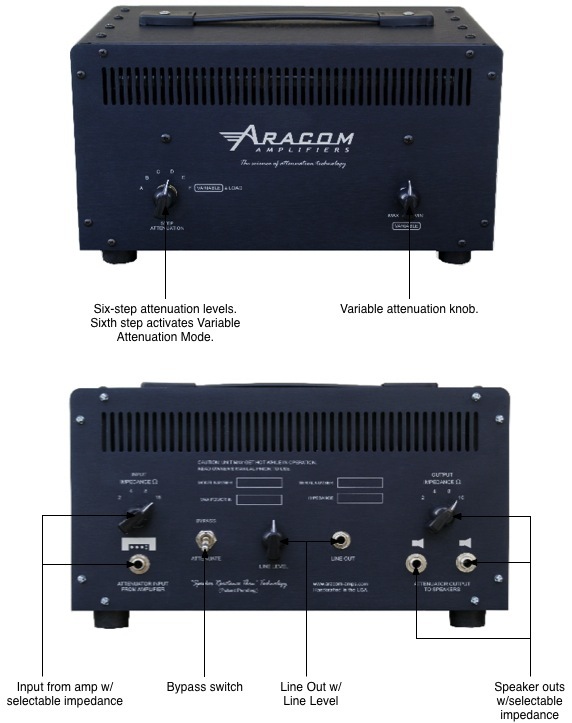 In any case, I recorded a couple of videos this afternoon, talking about this wonderful device by Aracom Amplifiers. BTW, recorded these clips with an Alesis VideoTrack. Nice little unit. Not sure how long I’ll actually use it because I actually do want a better picture. But for now, it’s great to have an all-in-one solution to get some video out! For more information on this great attenuator, go to the Aracom PRX150 product page! Joe Satriani uses an attenuator!!! That’s about all the information I know other than how he raved about it to Doug who, in turn, contacted Jeff to get a unit; and since he got it, Doug has been raving about it on The Gear Page, and will be featuring it in his DVD. This is not so much a plug for the PRX150-Pro as it is meant to underscore that even guitar heroes like Satch see the virtues of using an attenuator. Speaker breakup aside, some amps just don’t hit their sweet spot until they’re cranked up and played wide open. Unfortunately, the volume level at that point is too high to be comfortable for most human ears. With an attenuator – and a great one in the PRX150-Pro – players can crank their amps to their sweet spot, and not worry that their ears are going to bleed. I know, there are several people who eschew attenuators as being tone suckers. But the new breed of attenuators such as the Aracom PRX150-Pro are so much more transparent than the older attenuators on the market; and yes, they are particularly more expensive than their older counterparts, but how much is great tone worth? We gear sluts think nothing about spending a few hundred bucks on a pedal. For what a great attenuator gives you, it’s totally worth the investment. For more information on the Aracom PRX150-Pro, go to the PRX150-Pro product page! Guitars were recorded at conversation levels using the Aracom PRX150-Pro attenuator. I wrote “Strutter” a couple of weeks ago. Like many of my instrumentals, it started out as a backing track that I could practice over. I was simply experimenting with doing leads over a dominant 7th chord progression after watching more of Chuck D’Aloia’s “Blues with Brains” instructional video and wanted to try out some of the stuff he talked about. Well, one thing led to another, and I started getting ideas that I started running with. So I laid them down. I actually completed the recording several times using different guitars and amps for the lead, but every time I listened to it, I just wasn’t satisfied with the lead. I knew I wanted a bright sound tone, either from a Strat or from a bridge humbucker, but I wanted the lead to have some hair as well. My Strat just didn’t work here because of the vintage-style low power single coils I have in it. And the PLX18 BB was just a bit too fizzy with the stock speaker. So I sat on the song for awhile, though I did keep on refining the phrasing. As far as amps are concerned, I have several to pick from, but their tones are very vintage smooth. Even my go-to amp, the VRX22, was just too “nice-sounding” for what I wanted. The PLX18 BB got me right into the ballpark. It doesn’t have loads of gain, and while the breakup is smooth and expansive – very 3D – it also has lots of balls for which Plexi-style circuits are known. But even then, the speaker I had in it was just too harsh in the highs, with an overabundance of fizz. In earlier recordings with the amp, I had to bleed off highs. I really didn’t like doing that because I don’t like to EQ my guitar parts. So it wasn’t until last night when I swapped out the stock speaker (Eminence Red Coat Red Fang) with a Fane Medusa 150 where everything came together. Previous versions of the lead track included wah, but I removed the wah and re-recorded that portion of the song mainly because I just wanted a slightly fatter tone. The amp was already dimed, so I just added a couple of stacked overdrives using my KASHA overdrive and Geek Driver. This resulted in a bit brighter, but fatter tone. Finally, the cool thing was that I recorded the song in two takes. The second take was the ending. I think my hand was getting tired from all the bending, and I made a couple of mistakes. 🙂 It’s amazing how your playing flows when your tone inspires you!